At the beginning of their relationship, the apostle Paul was treated with great love and respect by the Galatians. On his first visit to Galatia, he was “received.., as an angel of God, even as Christ Jesus” Gal. 4:14. They loved him so much that they would have plucked out their own eyes and given them to him if possible Gal. 4:15. However, as time went on their attitude toward Paul changed. They treated him with coldness and suspicion because he pointed out their faults and the dangers to their souls. This is why he asked the question, “Am I therefore become your enemy, because I tell you the truth?” Gal. 4:16. The duty of the gospel preacher often involves the delivery of an unpleasant message. In life all is not roses, there are thorns also. The gospel of Jesus Christ is not all sweetness and pleasantness. There is no doubt that God’s Word is full of edification, comfort, and pleasant thoughts, but it also contains prohibitions, condemnations, threats, warnings, and negative statements. The message presented by the gospel preacher must be balanced. It should be edifying and comforting, but it must also include warnings and admonitions. This is where the conflict begins. If you haven’t noticed, truth is not very popular today. We should not be surprised to know that those who proclaim it are not very popular either. Today is similar to the time that Isaiah wrote about: Isa. 30:8-11 “Now go, write it before them in a table, and note it in a book, that it may be for the time to come for ever and ever: That this is a rebellious people, lying children, children that will not hear the law of the LORD: Which say to the seers, See not; and to the prophets, Prophesy not unto us right things, speak unto us smooth things, prophesy deceits: Get you out of the way, turn aside out of the path, cause the Holy One of Israel to cease from before us.” Here we have a group of people who wanted their ears tickled. Many of the inspired doctrines were a reproach to them. The dedicated messengers likewise were reproached and despised. Those who spoke the truth were treated as the enemy. In his letter to the Ephesians Paul declared the whole council of God. All gospel preachers have that same obligation and the duty to speak the whole truth in love Eph. 4:15. One can preach all their life, never preaching any error, and still not please God in their preaching. Those who preach the truth must present the truth on a variety of biblical topics, keeping back nothing that is pro table to the audience, but declaring the whole truth. It is important that we also recognize the importance of spiritual correction. Just because a person does not know the truth does not lessen its truthfulness. It is still the truth. Our acceptance or rejection does not change the truth. When Saul of Tarsus rejected the truth of the gospel (to the extent of condoning the brutal stoning of one of its messengers: Stephen) did this lessen its truthfulness? When Paul preached the gospel to the city of Lystra and was then stoned and left for dead Acts 14:19, did their rejection lessen their responsibility to obey the message? Rejecting the message or messenger does not change the truth-it only hinders the treatment. A doctor may inform me of a serious health problem. What good would it do for me to get mad at him for delivering the message? If I want to be helped, I need to accept the doctor’s message, face the problem, and seek treatment. The divine Word of God tells the story of a man named Zacchaeus in Luke’s gospel account, and this is the first and last time we hear mention of this chief among the publicans. We are not told much about this wealthy resident of Jericho, but what the scriptures do tell us of him speaks volumes about the things that were most precious to him. Scholars agree that Zacchaeus’s heritage was no doubt of Jewish descent because of his name and the fact that the Lord calls him a “son of Abraham.” But Zacchaeus wasn’t some common Hebrew or your basic run-of-the-mill Jew! He was the superintendent over all the tax collectors of the region west of the Jordan River! Although tax collectors in Christ’s time were known for being deceitful and greedy in their lucrative professions, the Bible tells us that Zacchaeus was not at all typical in this regard either. Here was a man who gave half of his goods to the poor in order to prove his benevolence, rather than greed! But more than that, Zacchaeus also restored anything that he had taken from others fourfold in order to compensate for any wrongdoing, keeping with the commands of the law (Exodus 22:1). These attributes teach us that this man was concerned with obedience to the law, which was uncommon with the publicans. ​Prior to the introduction of Zaccheaus in the 19th chapter, we read in Luke 17 how that Jesus was traveling to Jerusalem for the feast of the Passover, and he performed many miracles along that route, such as he did in Samaria and Galilee when he healed the ten lepers in a village nearby. He also spake parables and healed the blind man who cried out to him as he walked through the streets of another small village near Jericho in chapter 18. Word began to spread in advance to the city of Jericho that the famous miracle worker of Nazareth would be traveling through, and the crowds flocked to the pathways so that they might see the Christ! Keep in mind that these events occurred not too long before our Lord would be arrested, held captive, and falsely accused to the point that he was sentenced to death by crucifixion in Jerusalem, despite never breaking the law. Zacchaeus was evidently amongst this large crowd gathered that day in Jericho to see the Savior. 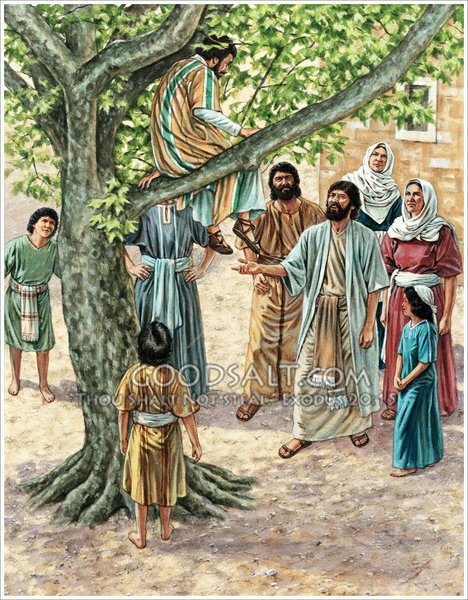 The text tells us that Zacchaeus was a man little in stature, meaning he was short in height and frame and he would not see Jesus if he stood there amid the crowd. So he climbed into a sycamore tree near the way where Jesus would pass by and stood there on a limb waiting for the man whose popularity and fame had spread so quickly throughout all the regions of Palestine. And it would be that day when Zacchaeus would find eternal salvation in Jesus who went to abide at his house. And it all came about because the chief among the publicans climbed up onto the limb of a sycamore tree to see the Lord. The lessons we can learn from this obscure character are fundamental to finding Bible salvation. The first lesson seems obvious—Zacchaeus sought to follow the way of Christ. Today’s world lacks a necessary desire to seek the truth! Most will accept whatever is convenient or sounds right so that it takes the place of actual effort needed to find the right way. Jeremiah prophesied that the chosen people of old would be delivered from their captivity if they would seek the ways of God once more (Jeremiah 29:12-14). In Psalm 14, David wrote of a time when God looked down from the Heavens to see if there were any who were seeking after him. Jesus once said that we should seek first the kingdom of God and his righteousness and earthly needs and blessings would be added unto us (Matthew 6:33). This is what Zacchaeus did. He wanted to see the Lord that day, and no multitude too large would deter him from such. The Lord promised to those who seek His will that they would find it (Luke 11:9-10). But seeking the ways of the Savior cannot be completed carelessly! This is why so many are easily led by the modern trends of religion. The Hebrew writer said that the Father rewards those who diligently seek him (Hebrews 11:6)! ​We must also notice that Zacchaeus is an example for us to prepare our homes. The Bible tells us that Jesus called Zacchaeus down from the tree that day saying, “Today I must abide at thy house!” This passage of scripture beckons the question that some Christians do not want to consider. What if Jesus was to abide at your house on this day??? What would He find? Zacchaeus had no time to run home and rid his house of any spiritual impurities that might cause the Lord to frown on him. He didn’t have time to set the roles of his house in order with regards to his children and spouse. He would not have the chance to erase the trends of society that may have crept into his home over time. Christ would abide at his house on that day! Not the next day, not the next week, not the next month; the Savior said, “Today I must abide at thy house! But this did not seem to bother Zacchaeus. He had apparently lived in a way that pleased God, for Luke describes the publican’s disposition as joyful when he thought of the Lord abiding in his home! But not only did this rich man welcome Jesus into his home, he took the salvation offered by the Lord without delay! How many of us would receive Christ into our homes joyfully? Fact is, much of the world would be ashamed to have Jesus into their homes, and perhaps, some of his own disciples would be ashamed as well. If the Lord came to your house today, would he find the husbands expressing the love of Christ towards their wives (Ephesians 5:25)? Would the Lord find the women working towards being that loving, chaste keeper of the home that Paul instructed Titus to teach about to the congregations on the island of Crete (Titus 2:3-5)? Would the Son of God find the children obedient to the parents (Colossians 3:20)? Even more than that, would the Savior find us daily on our knees in prayer like the old prophet Daniel did (Daniel 6:10)? Or would Jesus find us searching the scriptures regularly, following the example of the Bereans (Acts 17:11)? Do you want to prevent being crowded out by the world’s distractions? To do that, you are gonna hafta to put out an effort to develop an appetite for things that are spiritual. And that starts in your mind. We must learn to create a sanctuary in our minds where meaningless distractions are discarded and spiritual thoughts abound (Philippians 4:8). Only then can we mold our homes after the divine Word and its commandments! ​Finally, Zacchaeus teaches us a lesson in preparing for the Savior’s appearing! The man called Zacchaeus teaches us many lessons that are key to our salvation, but perhaps none more direct than this one. He would not let anything stop him from seeing the Savior for the first time. That took preparation. It may have seemed like a small thing for this man to make it a point to be near the path where Jesus would walk. It may have seemed like no big deal for the chief publican to climb a tree so he could see over the crowd. But these were steps made in preparation for the Lord’s appearing. Here was a man who strove for righteousness despite knowing nothing about the Lord. Here was a man who Jesus singled out of the crowd because of his “don’t be denied” mentality to see Him. Here was a man who deserved salvation! How about us? We know the Lord will come, but the when is beyond our frailty of mind. Jesus said that we know not the day nor the hour when He will return (Matthew 25:13). We must understand how serious it is to prepare for meeting the Lord in judgment, while many allow it to pass them by. In Paul’s letter to the Romans, he said that it was high time to awake out of sleep and seize salvation (Romans 13:11)! There are times in life when we do things because it is time to complete certain tasks. But when it’s high time to do something, the opportunity has past, and we are overdue to complete the task at hand. In other words, this is something we cannot put off any longer. If we procrastinate further, the window of opportunity will close and our chance at salvation will have passed us by. You may have close friends like I have who need to obey the gospel but continue to let opportunity after opportunity pass them by. That’s not what Zacchaeus did! Jesus told him to “make haste” in coming to gain salvation. He wasted no time because salvation from Jesus was valuable to him! Today Jesus says the same thing to us. “Make haste!” Salvation is available to everyone who is willing. And we ought not turn it away! We can hear the word (John 6:45), believe the Bible’s claims that Christ is God’s Son (John 3:16), repent of your sins (II Peter 3:9), confess Jesus as Lord (Matthew 10:32), and be baptized for the forgiveness of our sins (Acts 2:38). Then, upon remaining faithful to the Lord until death (Revelation 2:10), we will have prepared for the Savior’s appearing the way the scriptures teach us too. ​Waves of people identify with Christianity, whatever that means. This notion seems to hint at a surface appreciation of Christ and what He taught, or what people say He taught. Word of mouth, rather than reading of the Bible itself, lead such waves of identifying “Christians” to make statements such as, “I agree with the main principles of the Bible and its general message.” Consider the notion that Jesus defined discipleship within the gospels, particularly the gospel of Mark, and while considering, realize that word of mouth does not substitute for careful reading of God’s self-revelation. Careful reading of this revelation in the Bible has led this author to realize the heavy, radical cost of discipleship outlined by Jesus Himself. ​The premise of Mark’s gospel is discipleship. John Mark writes a brief, action packed, more do than said, gospel record of Jesus, developing in Christ’s ministry on earth, His authority to call disciples, and exactly what that call to discipleship looked like. A closer examination of scripture should reveal that Jesus was not asking for fans. This was manifested in his reply to one man’s excuse for why he could not follow Jesus, “Follow me, and let the dead bury their own dead,” (Matt. 8:22). Perhaps this is the first inkling that Jesus does not respect someone who simply “identifies” with Him. ​A careful investigation of the middle portion of Mark’s gospel record should highlight the essence of Jesus’ call to discipleship. Several Bible scholars have noted three sections in Marks gospel, with chapter 8-10 composing the middle section. This break in the gospel account centers on three relevant discourses between Jesus and His most intimate disciples. In these discourses, Jesus predicts his death in Jerusalem three separate times. No other gospel record mentions all three predictions. Notice also, after each prediction, Jesus teaches His inner 12 an important lesson on what it means to be His disciple. Mark’s arrangement of this material in such a way is more than happenstance. ​Zone in on Jesus central message throughout the discourses of Mark 8-10. Read Mark 8:31-38, 9:30-37, and 10:32-45. The three messages taught by each discourse are as follows: self-denial, humility, and servitude. Now, consider the relationship between these three discipleship characteristics and their connection to Jesus’ triple announcement that He must soon be killed by authorities in Jerusalem. Jesus is emphasizing the core cost of discipleship: death to self, illustrated by His literal death by crucifixion. Paul reflects this language in Galatians 2:20 when he says, “I have been crucified with Christ; it is no longer I who live, but Christ lives in me…” Christ calls for a radical death to selfish desires, ambitions, and self-centered attitudes in general. 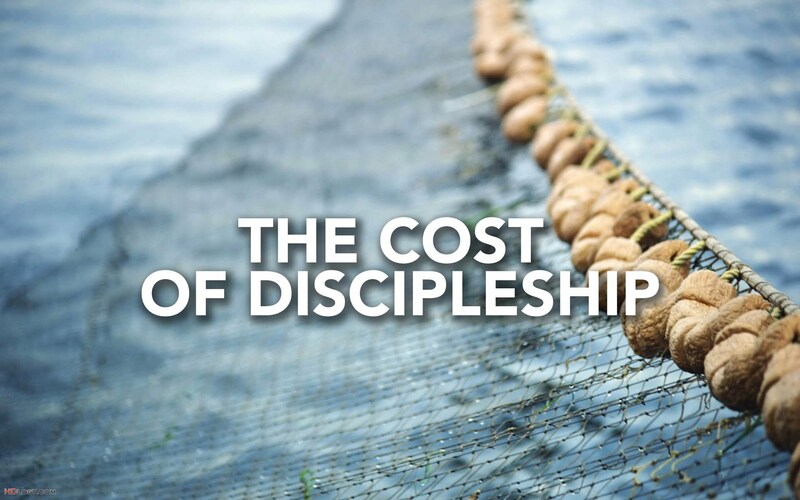 Stay tuned for a complimentary article portraying this cost of discipleship in the Christian’s life. For now, take up the cross of self-denial and follow Jesus. Jesus doesn’t identify with fans. He identifies with fully committed martyrs to self. This is a salvation issue.